Blockchain is an emerging technology for decentralized and transactional data sharing across a large network of untrusted participants. It enables new forms of distributed software architectures, where components can find agreements on their shared states without trusting a central integration point or any particular participating components. Considering the blockchain as a software connector helps make explicitly important architectural considerations on the resulting performance and quality attributes (for example, security, privacy, scalability and sustainability) of the system. 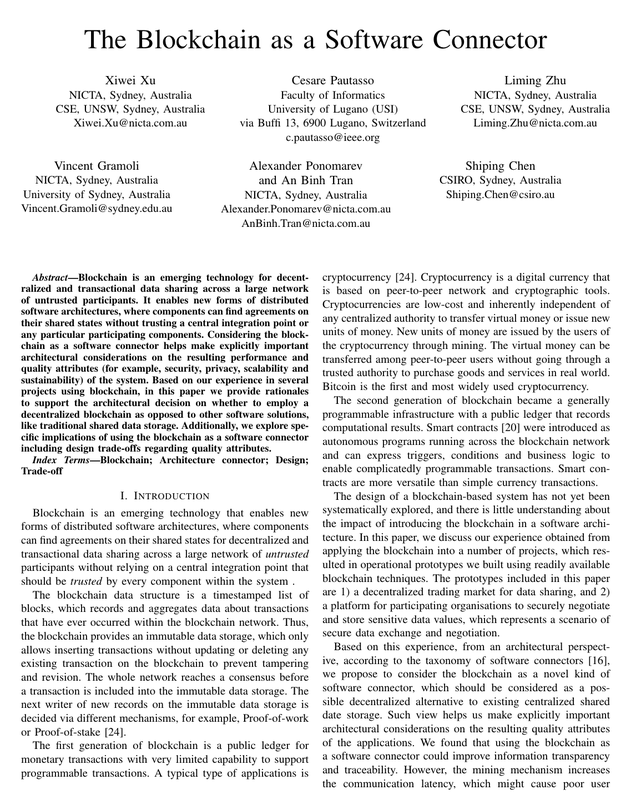 Based on our experience in several projects using blockchain, in this paper we provide rationales to support the architectural decision on whether to employ a decentralized blockchain as opposed to other software solutions, like traditional shared data storage. Additionally, we explore specific implications of using the blockchain as a software connector including design trade-offs regarding quality attributes.